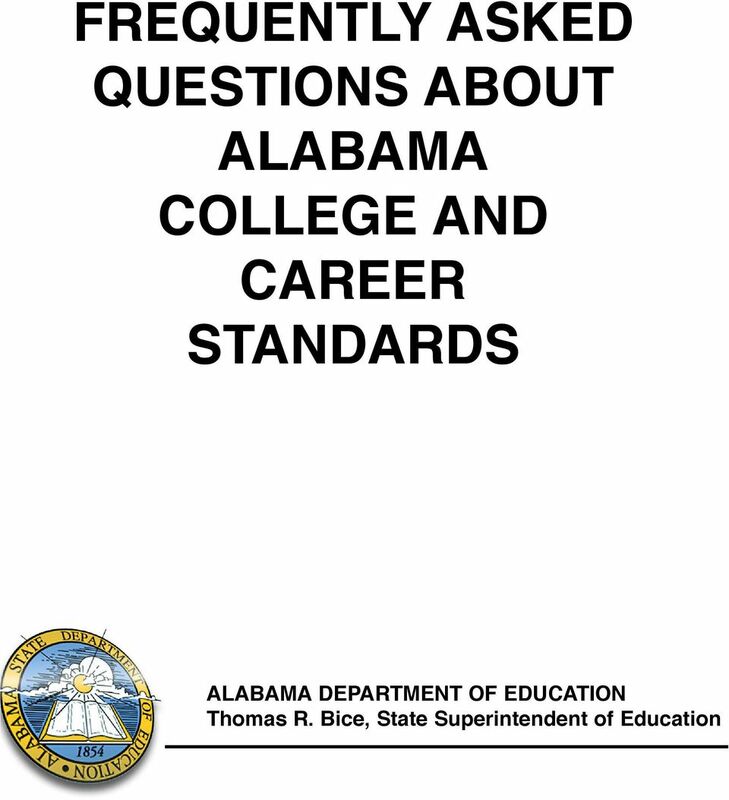 Download "FREQUENTLY ASKED QUESTIONS ABOUT ALABAMA COLLEGE AND CAREER STANDARDS"
2 Frequently Asked Questions The Standards What are Alabama College and Career Ready Standards? The Common Core State Standards are a set of consistent, high quality academic benchmarks that clearly define the knowledge and skills all students should master by the end of each school year in order to be on track for success in college and career. 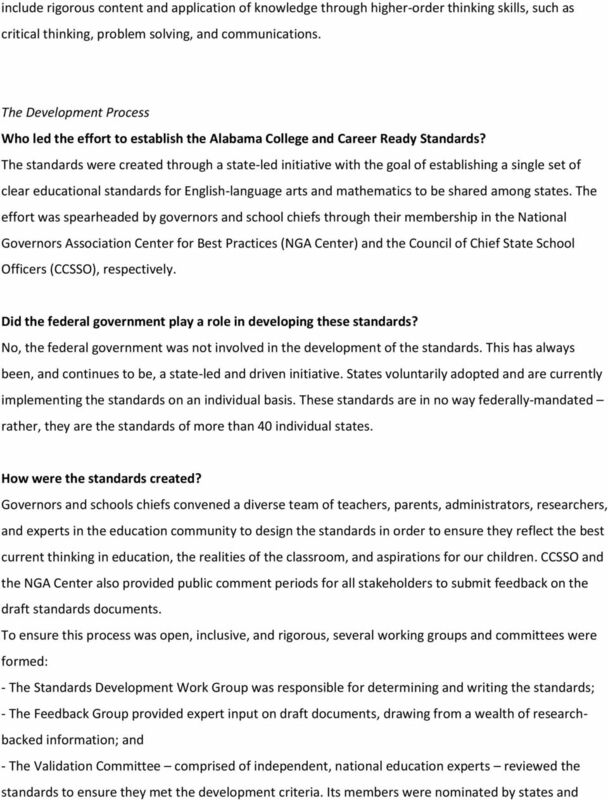 The standards were created through a state-led initiative and have been adopted by more than 40 states. 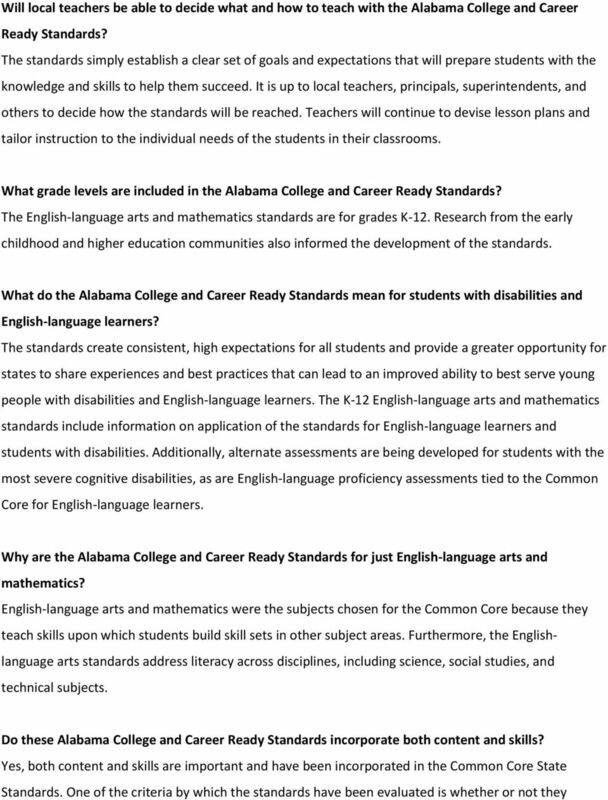 Why are the Alabama College and Career Ready Standards important? The standards are a common sense first step toward ensuring our children obtain the best possible education no matter where they live. With clear academic expectations for each grade level, teachers, parents, and students can work together toward shared goals. Furthermore, the standards draw from the best existing standards in the country and are benchmarked to top performing nations around the world, ensuring that our students are well prepared to compete not only with their peers here at home, but also with students around the world, maintaining America s competitive edge. With consistent standards, states can also now opt to pool their collective expertise and resources in order to reduce costs for each individual state and bring the most well-informed, creative thinking to various efforts around the standards. For example, states can work together to: - Make expectations for students as clear as possible to parents, teachers, and the general public; - Encourage the development of textbooks, digital media, and other teaching materials aligned to the standards; - Develop and implement high quality curricula that best enable teachers to help all students reach the standards; - Develop and implement comprehensive assessment systems to measure student performance against the standards and replace the existing testing systems that often are inconsistent, burdensome, and confusing; and - Evaluate and advocate for policy changes needed to help students and educators meet the standards. 7 - Guide educators toward curricula and teaching strategies that will give students a deep understanding of the subjects and skills they need to learn. Who is in charge of implementing the standards? The standards are being implemented by each state individually through the collaboration of various groups including SEAs, local education authorities, institutes of higher education, state educator associations, and individual school leaders. They do not tell principals how to run their schools, and they do not tell teachers how to teach, nor do they mandate or include any accompanying assessments, curricula, or instructional materials. While states are voluntarily coming together on certain implementation-related efforts, each state is independently and solely responsible for putting the standards into practice. Will the standards be updated? Yes, there will be an ongoing state-led development process to continuously improve the standards. Standards help teachers ensure their students have the skills and knowledge they need to be successful by providing clear goals for student learning. 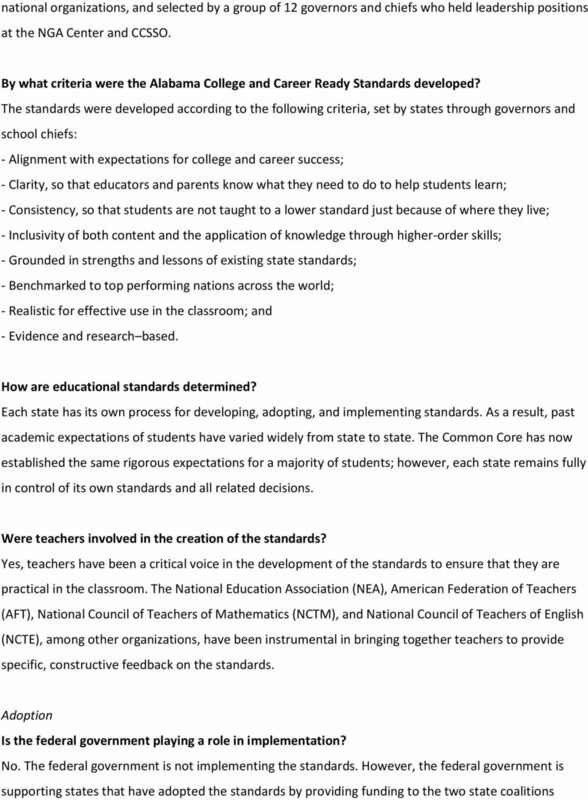 FREQUENTLY ASKED QUESTIONS New Mexico and 45 other states have adopted Common Core State Standards (CCSS) for public schools, establishing state-of-the-art guidelines for teacher and student competency. Assessments in Ohio. To date, more than 45 states and the District of Columbia have adopted the CCSS. For more information about the new assessment and its benefits for Florida students, please see the attachment. Testing opt-out/refusal guide for South Dakota. Form completed by UOO Admin (LM) Contact information (email) unitedoptoutnational@gmail. aplusala.org Standardized Testing in Alabama and Nationwide Thomas Rains, Policy Director December 2013 Standardized testing serves several purposes. Tests provide feedback on a student s performance. 3. 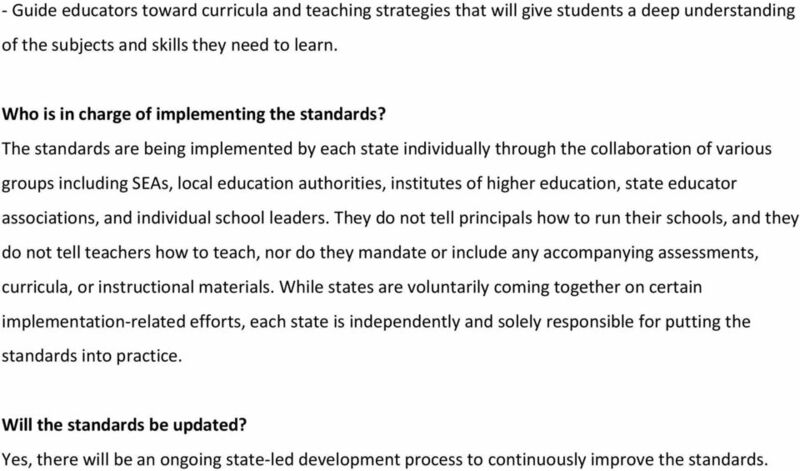 Why did the Department decide to require the statewide use of core instructional materials?